I can barely contain myself at how amazingly amazingly gorgeously cool and scrumptious this was. It’s not my recipe…. Come on, even I don’t use that many semi-made up adjectives to describe my food! The pastry chef at work makes beautiful focaccia for the lucky lucky diners every night and I asked him how to make it the other day, I wasn’t prepared for the instant recipe that came out of his mouth, and then when the answer to my ‘Where can you by sourdough?’ question was, ‘ummmm, you have to make it’ I decided focaccia possibly wasn’t for me. 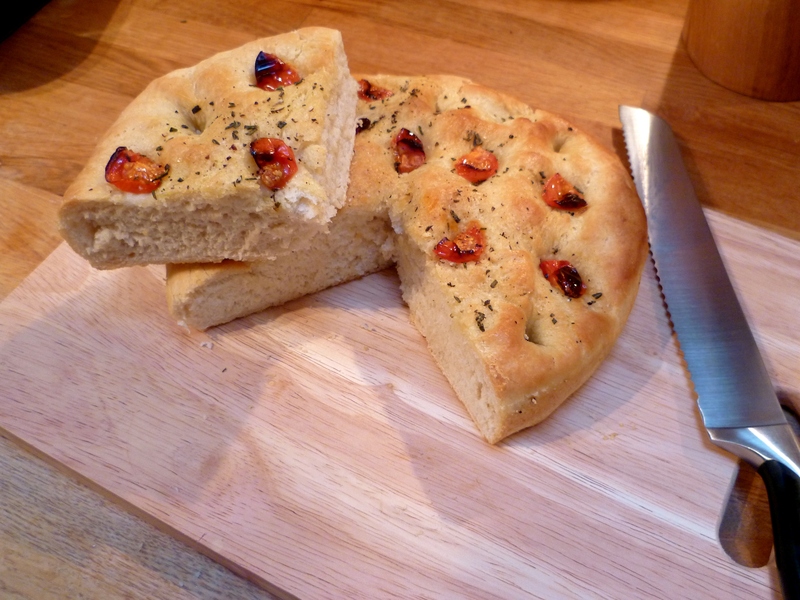 But, never fear Hugh Fearlessly-Eats-it-All to the rescue and his book entitled….hang one while I search for it on my shelf….’River Cottage Every Day’ has a MUCH easier recipe for focaccia in it. It’s not a quick task I’m not going to kid anyone that this is an after work before dinner thing. It’s a weekend treat, and make sure it’s a treat because it looks so good that you’ll eat it all way too quickly! I did half of Hugh’s recipe and used a normal cake tin as I was only feeding two of us. Sprinkle rosemary over the top and lots of lovely olive or rapeseed oil and lashings of salt – now do you see why I said it’s a treat….? It’s not healthy, but it looks awesome, tastes amazing and burns a few precious calories during the kneading process. I have, in case you didn’t notice, discovered rapeseed oil. I spent many summers at school loathing rapeseed partly due to the name – it doesn’t exactly endear itself to teenage girls. But also becuase a great many of my friends were rendered pretty much unable to breath, see or speak once it came into flower. So great was the power of the pollen that eyes streamed uncontrollably, noses blocked and the school was rife with the sound of sneezes. I was blissfully unaffected – now in my twenties I only have to look at a picture and I get tearful – I now get the grown up hayfever which is obviously much worse! Sorry I’m waffling – rapeseed oil is, in my opinion, a pretty good apology from the plant to us hayfever suferers, it tastes great and is a rather good alternative to oilve oil every now and then. I don’t prefer it to my beloved olive oil but it’s quite nice to chop and change – keep the old tastebuds guessing. I LOVE baking bread. Its probably one of my favourite things to do in the kitchen. 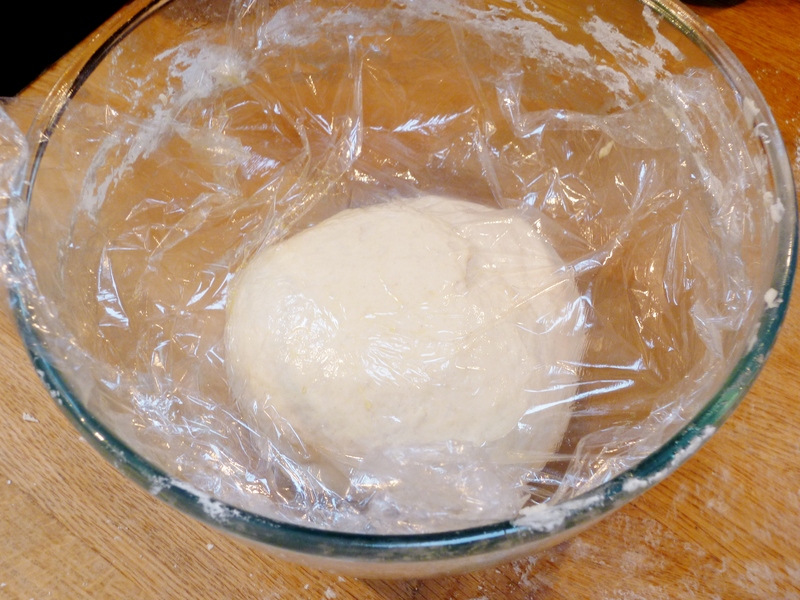 Don’t get me wrong, I am by no means an expert but the whole kneading the dough and punching the crap out of it is a great stress relief especially after a hard day/week at work. Then its the rising part. Just to see biology, chemistry and physics all in action is amazing to me (ok, I’m geeking out a bit now). Thanks for the post – I’m going to try it this week and will send a pic of how it goes. Oh! You and Lolli make my day with your comments, you really do! Thank you! 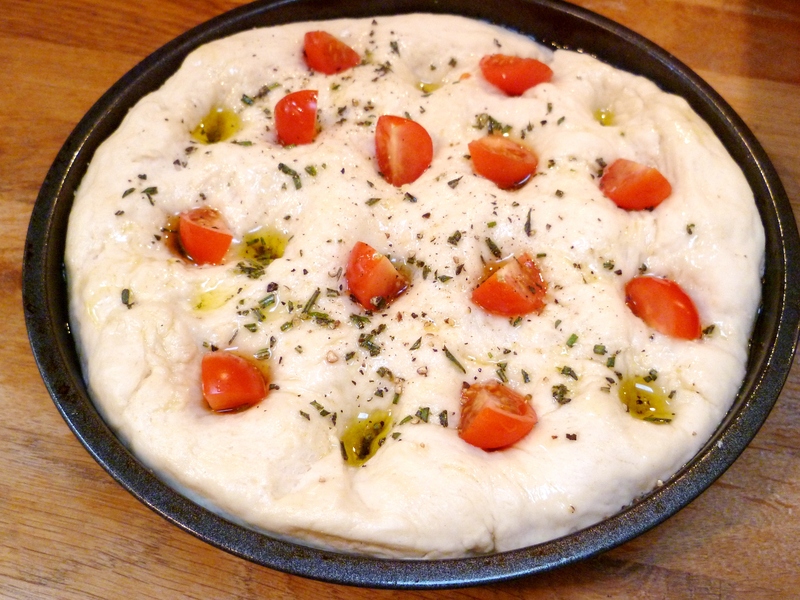 I loved making that focaccia. Make sure you only do half or it’ll be too squashed in the tin. Good luck and send me a pic! I wish I had that many oils but I only have 3 – E V olive, sesame (rarely used) and Rapeseed! Can’t find truffle oil but think that when I do find it I’ll be too stingy to buy it!